Jennifer Arbittier Williams, assistant United States attorney with the Criminal Division of the U.S. Attorney's Office in Philadelphia, left, details the results of an investigation into IBEW Local 98 and its leader, John Dougherty, right. In a wide-ranging indictment unsealed Wednesday, federal authorities portrayed the region’s most powerful labor leader, John J. Dougherty, as an unscrupulous kingpin who enriched himself on the backs of union members and exerted his influence to steamroll opponents and corruptly bend the government of Philadelphia to his whims. The chief weapon in his arsenal, prosecutors said, was City Councilman Bobby Henon, whom Dougherty helped propel into office in 2011 on a tide of union money, then allegedly used as a tool to leave his mark on pressing legislation facing the city. Together, they are charged — along with six other members and allies of Local 98 of the International Brotherhood of Electrical Workers — as codefendants in a sprawling criminal case that threatens to upend the landscape of politics and organized labor across Pennsylvania. The allegations detailed in the 116-count indictment range from the typical fare of white-collar cases — claims that Dougherty and others embezzled more than $600,000 between 2010 and 2016 to fund personal shopping sprees, restaurant dinners, and annual trips — to staggering claims of corruption and political vindictiveness. But emerging through it all was a portrait of Dougherty as a man intent on reshaping the city to his vision through sheer force of his own considerable clout. “I got a different world than most people ever exist in,” Dougherty said in a 2015 conversation caught on an FBI wiretap and quoted in the filing. Dougherty, the indictment alleged, showered Henon with benefits, including sports tickets and a $73,131 annual union salary, then used him as a vise to squeeze his wide array of foes — including Comcast Corp., the Children’s Hospital of Philadelphia, and even a tow truck driver who tried to haul away the union boss’ car. As prosecutors told it, Dougherty’s decision to throw his weight behind Mayor Jim Kenney’s signature soda tax in 2016 — a move that won it the support it needed to pass — grew solely out of a desire for revenge against the Teamsters Union, which opposed the bill and had run a TV ad portraying Dougherty in a negative light. 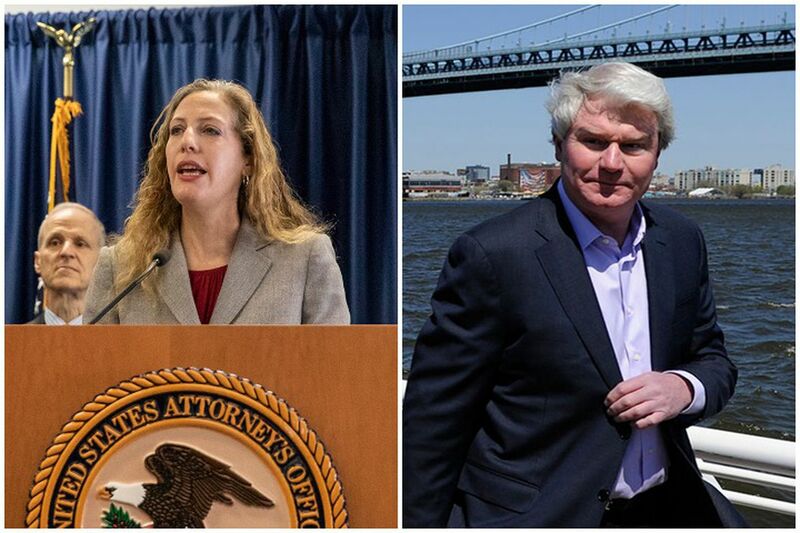 First Assistant U.S. Attorney Jennifer Arbittier Williams (center) speaks alongside Michael Harpster (right) head of the FBI's Philadelphia Division, and Guy Ficco (left), his counterpart at the IRS, regarding the indictment of Local 98 leader John "Johnny Doc" Dougherty on Wednesday. The criminal case unsealed Wednesday brought to a head rumors that have dogged the pugnacious labor leader and the councilman since 2016, when federal agents raided more than a dozen sites associated with Local 98. Flanked by FBI and IRS agents at a morning news conference in Center City, First Assistant U.S. Attorney Jennifer Arbittier Williams accused Dougherty of selling out the union’s members, and accused Henon of abdicating his duty to his constituents. “He made decisions on behalf of John Dougherty, rather than the people that elected him to City Council,” she said. But both Dougherty, 58, and Henon, 50, were quick to reject that characterization and vowed to fight the case. They and their six codefendants face charges of embezzlement, bribery, and theft that threaten to send them to prison for decades. They are expected to surrender to authorities and make their first court appearances Friday afternoon. >> READ MORE: Who is ‘Johnny Doc,’ Philadelphia’s most powerful union leader? Meanwhile, Henon took to Facebook to defend himself and pledged to remain in office. Few in city government or in the city’s building trades rushed to call on either man to resign. Kenney, at a news conference Wednesday, said it was up to Henon to decide whether he should step down. Across town, about two dozen Local 98 members spent the morning cloistered inside the Spring Garden Street union hall and dodged reporters’ questions once they emerged. Union spokesperson Frank Keel said Local 98’s members intend to stand by the man who has led them since 1993. Under Dougherty’s leadership, the 4,700-member organization has grown into the biggest independent source of campaign money in the state. The union’s money and manpower have helped elect mayors — including Kenney — as well as City Council members, county commissioners, members of Congress, state legislators, governors, and more than 60 judges, including the union leader’s brother, Pennsylvania Supreme Court Justice Kevin Dougherty. >> READ MORE: How will ‘Johnny Doc,’ Local 98 move forward in Philly politics as the feds move in? Michael T. Harpster, head of the Philadelphia office of the FBI, and Guy Ficco, his counterpart at the IRS, stressed at Wednesday’s news conference that the charges in their joint investigation should not be read as an indictment of the union or its members. Investigators built their case in much the same way that Dougherty accrued his considerable clout — by paying close attention to a small circle of insiders the union leader has cultivated in his union, city government, and the South Philadelphia neighborhood where he grew up. Henon, for example, joined the union as a seasonal worker and rose through the ranks from apprentice to foreman to business agent. He served as Local 98’s political director from 1999 until his election to Council in 2011 to represent parts of Northeast Philadelphia and Port Richmond. He was named Council’s majority leader in 2016. The other union employees charged Wednesday had long-standing business and personal ties to Dougherty and Local 98. They include: Local 98 president Brian Burrows, 58; union political director Marita Crawford, 49; Michael Neill, 52, the head of its apprentice training program; and two office employees — Dougherty’s nephew Brian Fiocca, 27, and Niko Rodriguez, 27. And after investigating that inner circle for years, agents emerged with a plethora of recordings and financial records indicating that Dougherty and his associates burned through more than $600,000 of Local 98’s money with little hesitation. More than $6,000 went toward sending former Philadelphia District Attorney Seth Williams’ daughters on summer camp trips abroad. Dougherty had hoped to win Williams’ endorsement for his brother’s 2015 race — and succeeded; Williams even appeared in a video supporting the state Supreme Court candidate. Personal purchases at Target — dog food, Lucky Charms cereal, nail polish, mouthwash — and takeout meals for Dougherty’s family from the Palm and other restaurants were regularly reimbursed by the union after being submitted as “Food for Toys and Turkeys Volunteers” and other charitable purchases, according to the indictment. Tickets worth thousands of dollars for concerts by Taylor Swift, Justin Bieber, and Bruce Springsteen were charged to Local 98’s American Express accounts, and provided to relatives of Dougherty and other union officials. Union funds also were used to cover extensive renovation projects at Dougherty’s house; the homes of some of his family members; and Doc’s Union Pub, the bar he used to own in South Philly. Much of the work was done by one firm: Massa Construction Corp., a construction contractor based in the Bustleton section of the city. Its owner — Anthony Massa, 65 — on Wednesday became the third of Dougherty’s longtime friends who were not union members to be charged as part of the investigation. New Jersey electrical contractor George Peltz and Pennsport chiropractor John Moylan were charged separately earlier this week. But of all the people Dougherty leaned on to expand his wealth and influence, he turned to Henon — who once described the union boss as his “best friend” — again and again. The indictment is rife with quoted conversations between the two men as they negotiated what stance the councilman should take on issues ranging from audits of the Philadelphia Parking Authority to issues affecting other unions, like plumbing code legislation. Dougherty allegedly used Henon to pressure Comcast to steer nearly $2 million worth of electrical work to the company of a friend as the media conglomerate negotiated the renewal of the city’s 15-year cable lease in 2015. The firm’s rates were 60 percent higher than those for nonunion workers. “That is why you are over there, that’s why we raised $600,000 [in contributions to Henon’s campaign],” Dougherty recounted telling Henon in a conversation that year, quoted in the indictment. In a fit of pique that same year, prosecutors said, Dougherty had Henon use his sway over the Department of Licenses & Inspections to stop nonunion workers from installing MRI machines at Children’s Hospital of Philadelphia. “I don’t give a f--- about anybody, all right, but f---ing you and us ... and you know that." At Dougherty’s request, Henon also allegedly squashed a 2016 audit of the PPA that would have ascertained whether it could be sending more money to the Philly schools. And when a tow truck driver picked up Dougherty’s car in 2015, requiring him to pay $200 to release it, and failed to give him $10 back in change, a furious Dougherty knew whom to call. John Dougherty, left, and City Council candidate Bobby Henon, right, talk at Famous 4th Street Deli on Election Day in Philadelphia, Pa. on November 8, 2011. In a 2015 editorial, the Inquirer questioned Dougherty’s influence on Council — a stance that, according to the indictment, enraged the union boss. Dougherty urged Henon to respond — to insist to the paper’s readers he was no union puppet but rather his own man. An op-ed from the councilman appeared in a subsequent edition of the paper. But the indictment says Henon didn’t write a word of it: The real author was Dougherty, who dictated it to his spokesman and had it signed with the councilman’s name. Contributing to this article were staff writers Chris Brennan, Juliana Feliciano Reyes, Mark Fazlollah, Craig R. McCoy, Chris Palmer, Mensah M. Dean, Kristen A. Graham, William Bender, and Andrew Seidman.